Team Shanren Academy was able to compete in the 2014 (Golden State) USAWKF International/National Wushu Championships on the weekend of June 14th and 15th. 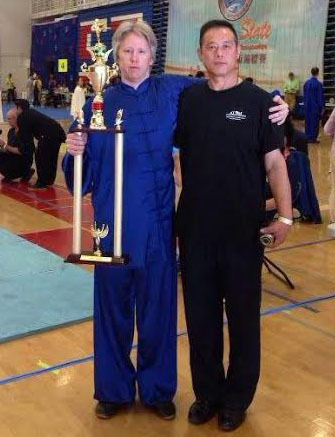 Here is a photo of Master Ding and student, Scott Hall, accepting 1st place trophy for Chen Style – Other. Scott performed a shorted version of the Chen Style – Hong Form 1st Routine. Overall, there were 491 total competitors for over 100 separate events for gongfu/taiji performances with almost over 2,000 spectators. Congratulations to Team Shanren Academy! Shanren Academy will be on a Winder break as Master Ding travels to China from January 13th to February 17th to teach and visit with family. Classes will begin again on February 20th. Also stay tuned for exciting announcements as Shanren Academy begins offering classes in Elizabethtown! To clarify further, the 2012 Louisville Tai Chi & Qigong opens on the 22nd at 9am. During the first hour, there will be group practices of the various styles of tai chi and qigong. The first demonstration starts at 10am. So be sure to get there early to watch and participate in the whole event! Be sure to join Shanren Academy at the 2012 Louisville Tai Chi & Qigong Day on September 22, 2012. Louisville Tai Chi & Qigong Day will showcase many varieties or methods of practicing these two ancient Chinese exercises. Local tai chi and qigong instructors will demonstrate several styles of exercise and be available to answer questions and provide class information. The first demonstration starts at 10:00 AM so come early to catch all the excitement and learn more about tai chi and qigong!